After fighting to have their sound heard in other projects and now as a group, the trio of Middle Kids (featuring Hannah, Tim and Harry) signalled their unshaking talent as musicians through their debut album release Lost Friends. 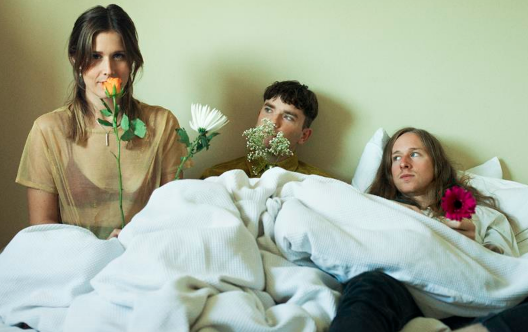 Embarking on a national tour to celebrate their album, Middle Kids landed for multiple Melbourne shows, finishing the city’s leg of the tour on Saturday night at the Corner Hotel. Lottie Liams, the Melbourne soloist with a tender heart, opened the evening serenading the crowd with her rich vocals, wholesome acoustic guitar and some friendly ukulele. Using her folky charms, Lottie Liams placed her soul on the edge of the stage through her honest songwriting. The eighteen-year-old played a small set of originals, including both of her singles; 'Sunflower' and 'Running Home'. Lottie Liam’s sound was somewhat opposite from what the night would later hold, but her flowing, poignant vocals helped set a softened excitement heading into Ruby Field’s set. Ruby Fields, the young Sydney artist known for putting her heart in her lyrics and recently coming off of her own EP tour was the main opener for Middle Kids. Using her time up on stage effectively, Ruby managed to play a couple of new tunes, a cover and to get through her entire EP of songs in what could easily have been a headline show in itself. Ruby quickly busted out 'Ritalin' after arriving on stage, the popular single to precede her 2018, EP, Your Dad’s Opinion For Dinner, with her distorted guitar and her band thrashing away underneath, Ruby rocked through her set comprised of 'Libby’s Pink Car', 'Fairly Lame', 'Fairly Tame' and two new tracks not on the EP, 'Trouble' and 'Rock Ripper'. Ruby fit in well with the big emotional hitters of Middle Kids, with her own recordings bringing life and hardships into the frame. 'Redneck Lullaby' was a particularly hard-hitting piece with many members of the crowd tearing up to the memorable track. Yet, Ruby’s performance involved large chunks of fun, making cracks at her band members, her own situation in life and what it meant for her to be growing up. Ruby’s lighthearted fun helped with the mood in her set and helped raise the energy further before Middle Kids started. The big finish came through the likely choices of 'P Plates' and 'I Want', with both tracks having a huge reception from the crowd. It seemed everyone in the front row and beyond were belting out her lyrics, displaying clearly that Ruby has been able to create quite a connection with her fans through music. Completing the Melbourne leg of their Lost Friends album tour before heading off to Sydney, Middle Kids pulled out everything they had for their show at the Corner Hotel on Saturday. Shying away from the mellower sounds coming out of the album. Middle Kids’ performance showed their rock edge, however, the band were still able to slow down for some more nuanced performances, highlighted by Hannah and her keyboard late in the set. Middle Kids played a long list of their popular tracks, drawing from both their 2017 self-titled EP and a majority of their Lost Friends album. Getting underway with the opener from the album 'Bought It', it was clear the band was shaking the soft rock feel and displayed a formidable sense of exciting live music, rocking the Corner Hotel at its hinges and giving Richmond a good night of music. 'Old River', 'Your Love' and 'On My Knees' followed before the crowd was sent into overdrive with the exciting and incredibly popular 2016 single, 'Edge Of Town'. The singing was synchronised and loud, with the crowd almost as loud as a team song at the AFL. 'Don't Be Hiding', followed by 'Maryland' gave some of the more emotional pieces of the evening some room to move, with Hannah’s soft vocals taking to the forefront of the performance. Every member of the crowd was left holding their breath as Hannah’s rendition of her own song, 'Doing It Right' reverberated through the band room as her passionate and driven piano solo left hairs on end and crowd members speechless. Comfortable on stage, Middle Kids worked their personable magic, bantering with each other and having a few wise-cracks at the crowd, while wholly appreciating the opportunity to play to a sold-out crowd at the Corner Hotel. Both 'Lost Friends' and 'Never Start' appeared off of the band’s set. With Middle Kids seeming to close the performance with 'So Long Farewell, I’m Gone', before Ruby appeared side-stage to goad the crowd into the classic “one more song” chant. Thankfully, fans of the two popular songs weren’t disappointed as Hannah, Tim and Harry arrived back on stage one last time to wheel through both tracks, much to the crowd's delight.